But even with the history of talent coming from France, the kind of dominance they’re showing right now at the Motocross of Nations is something new even to them. France won their very first Motocross of Nations in 2001 with Yves Demaria, Luigi Seguy, and David Vuillemin, but some considered it a fluke since Team USA – the dominant team at the event up until that point, and the reigning champions of the event – stayed home following the 9/11 terrorist attacks. France hadn’t won a single MXoN between 2001 and 2014, but every since 2014, it’s been all Team France. 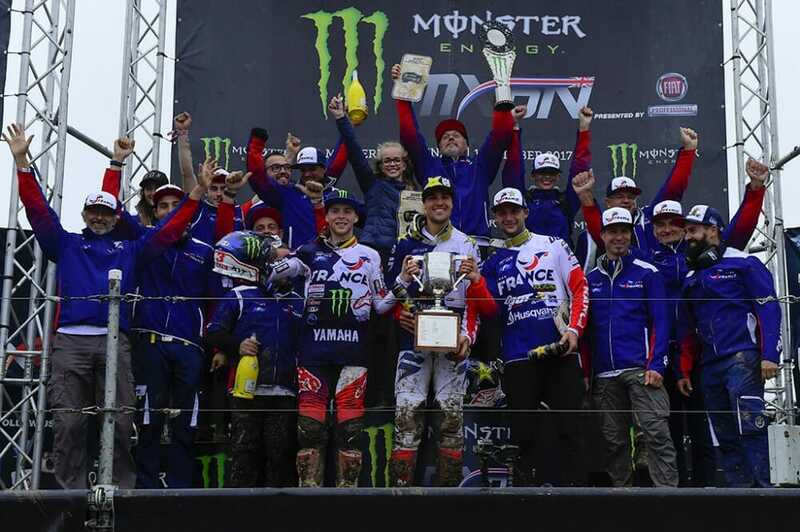 The three-time defending champs came to the 2017 Motocross of Nations at Matterley Basin, UK, with team stalwart Gautier Paulin (a member of every team since the victory in 2014), Romain Febvre (2015 MXGP World Champ and member of Team France in 2015 and 2016) and a wildcard in Christophe Charlier, who has a lot of past success in motocross but who had moved over to race the World Enduro Championship in 2017. 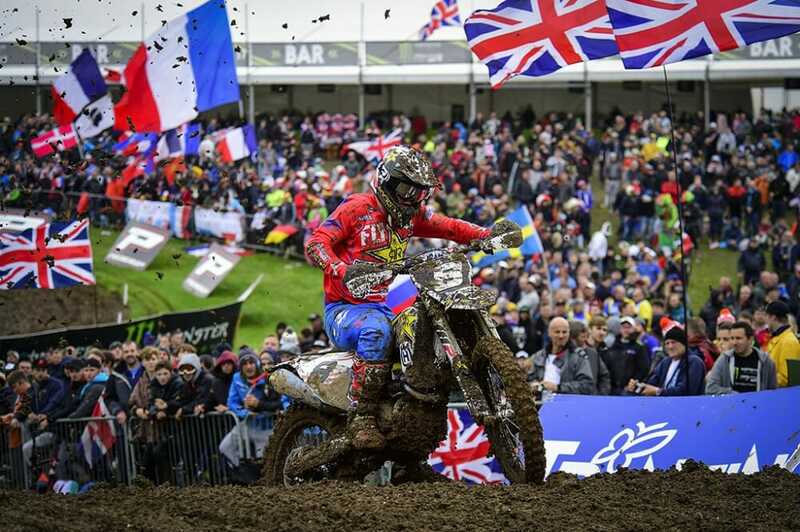 Undaunted, they took home their fourth MXoN victory in a row today in the UK. Three motos, each combining two classes of racing, with one moto score thrown out for each team, the top five of six moto scores would determine the overall for each team. In the opening moto of the day, Great Britain’s Max Anstie got his home crowd on its feet with the holeshot on his Husqvarna just in front of France’s Paulin, Switzerland’s Arnaud Tonus, Belgium’s Glenn Coldenhoff, Slovenia’s Tim Gajser, and Australia’s MX2 pilot Hunter Lawrence. USA’s Zach Osborne came around lap one in 10th and ended up in a battle there that lasted the whole race between himself, Belgium’s Jeremy Van Horebeek, and Denmark’s Thomas Kjer Olsen. Osborne got around Olsen momentarily near the end of the moto, but Olsen struck back and held off the American former GP racer for ninth. Team USA’s Cole Seely dropped out of the opening moto early on with a broken shock, while Great Britain’s Tommy Searle – on a KX250F after many years racing 450s – blew an engine around the same time. In the end, Anstie delighted his home crowd, taking home his first-even MXoN moto victory by over six seconds in front of Gajser, Paulin, Lawrence (the top MX2 racer in the moto), Switzerland’s Arnaud Tonus, Russia’s Evgeny Bobryshev, Van Horebeek, Coldenhoff, Olsen, and then Osborne, who had about 15 seconds to spare on Italy’s 9-time world champ Antonio Cairoli. Behind them came the Netherlands’ Brian Bogers, Estonia’s Priit Ratsep, and France’s Christophe Charlier in 14th on his Husqvarna FC250. No matter what, if the USA was going to pull this off, Seely’s score would have to be the worst they would do on the day. The Netherlands’ Jeffrey Herlings continued his hot streak in the race two, grabbing the early lead before ending up in a battle with France’s Romain Febvre during the middle of the moto. Behind those two off the start came Australia’s Kirk Gibbs, Italy’s Alessandro Lupino, and France’s Charlier with a blazing start on his MX2 machine. USA’s Osborne rounded lap one near the tail of the top 10, but was moving forward, while his Open teammate Thomas Covington found himself nearly dead last off the start. Covington fought forward for the whole moto, but could only muster 22nd, while Osborne fought his way all the way up to third with a last-lap pass on Lupino for the position. 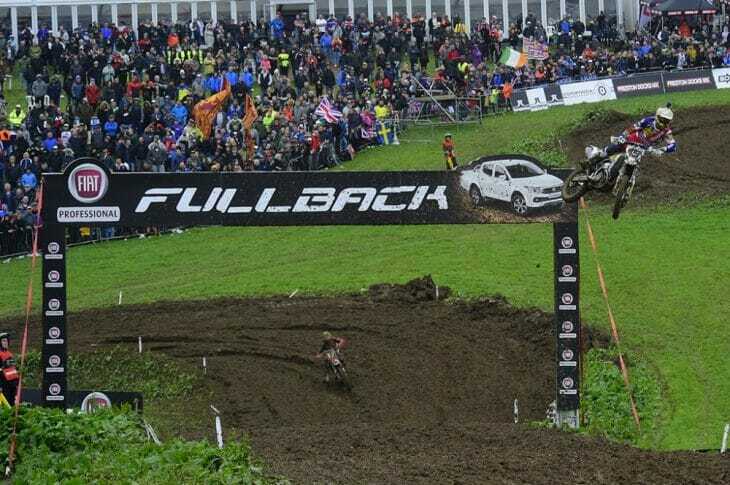 Herlings won the moto by 13 seconds over Febvre, Osborne, Lupino, Gibbs, Charlier (second MX2 racer), Great Britain’s Dean Wilson, Australia’s Lawrence, Belgium’s Bogers, Denmark’s Olsen, Estoni’s Tanel Leok, Belgium’s Kevin Strijbos, Puerto Rico’s (American racer) Daniel Sanayei, Switzerland’s Jeremy Seewer, and then Great Britain’s Tommy Searle. With the 3-22 in the moto for Team USA, the chance of a record-extending MXoN overall win were dashed. But there was still one moto to go. Anstie grabbed yet another popular holeshot in the final moto of the day in front of France’s Febvre, Belgium’s Van Horebeek, the Netherlands’ Herlings, Switzerland’s Tonus, France’s Paulin, Slovenia’s Gajser, Team USA’s Seely and the rest of the field. USA’s Covington started poorly, outside the top 20, but worked his way forward until eventually finishing 17th. Seely, who started near the front, ended up with a second DNF with a broken shock. Two DNFs from the American with the same problem. But Anstie, out front, was having another inspired race, battling with Febvre after the Frenchman found his way by, and then the pair were joined by the Dutchman on a hot streak, Herlings, around the time that Anstie fought his way back by Febvre for the lead. Herlings did what he could, dispatching of Febvre, but he couldn’t quite get Anstie, who won the moto by about a second over the flying Dutchman. 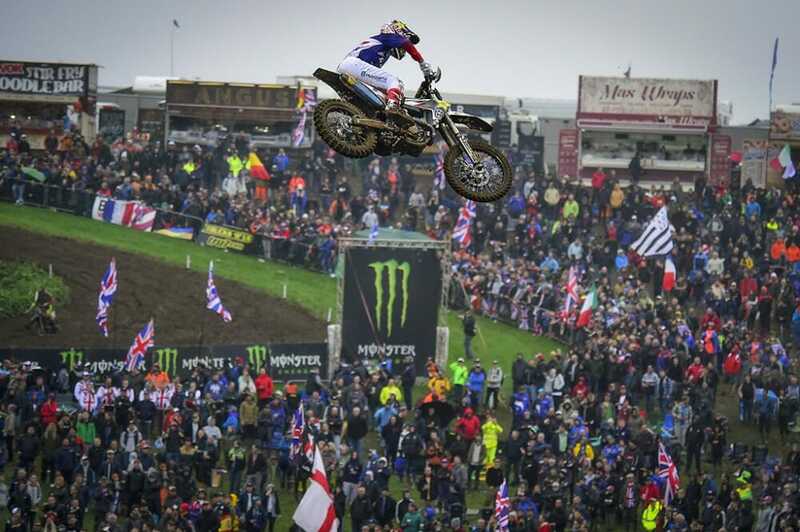 Anstie’s 1-1 score on his home soil will someday be the stuff of legend, and his performance propelled Team Great Britain to the podium for the first time in over 20 years at the Motocross of Nations. Behind Herlings came Febvre, Van Horebeek, Gajser, Paulin, Cairoli, Wilson, Seewer, Tonus, Coldenhoff, Bobryshev, Strijbos and Leok. But in the overall classification, Team France once again stood on the top step with an incredibly consistent performance. The five scores that counted for the French were a 2-3-3-6-6. While it didn’t win France any class overalls, it won them the overall that mattered most.